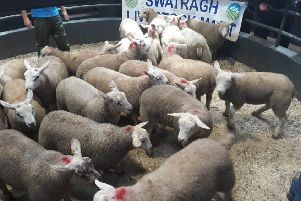 A good show of 176 head were on offer last Monday night with a sharper trade had by all. Plenty of customers were out looking for cattle for the grass and many more could have been sold at good prices. Steers sold to £1,200 for 550kgs and heifers topped at £1,110 for 550kgs. Ballymoney producer, Charolais, 550kgs, £1,200. Bushmills producer, Charolais, 390kgs, £900, 400kgs, £900. Armoy producer, Aberdeen Angus, 260kgs, £650, 240kgs, £650, 250kgs, £650. Coleraine producer, Limousin, 450kgs, £930. Glenarm producer, Limousin, 400kgs, £850, 300kgs, £720, 370kgs, £805. Ballycastle producer, Charolais, 300kgs, £760. Ballymoney producer, Aberdeen Angus, 530kgs, £1,065, 560kgs, £1,065, 535kgs, £1,070. Broughshane producer, Hereford, 600kgs, £1,080. Dervock producer, Aberdeen Angus, 505kgs, £945, 430kgs, £805, 440kgs, £820, 440kgs, £805, 435kgs, £870, 480kgs, £875, 480kgs, £895, 450kgs, £820. Armoy producer, Aberdeen Angus, 260kgs, £650. Bushmills producer, Simmental, 250kgs, £675, 190kgs, £545, 200kgs, £520. Ballybogey producer, Aberdeen Angus, 580kgs, £1,065, 590kgs, £1,010. Bushmills producer, Hereford, 340kgs, £690. Ballymena producer, Aberdeen Angus, 530kgs, £1,000, 500kgs, £940, 590kgs, £1,115. Cloughmills producer, Shorthorn, 590kgs, £1,100, 570kgs, £1,060, 510kgs, £1,030. Portglenone producer, Fleckvieh, 540kgs, £970, 540kgs, £930. Martinstown producer, Friesian, 600kgs, £920. Ballycastle producer, Limousin, 640kgs, £1,170, 680kgs, £1,180, 700kgs, £1,160. Bushmills producer, Charolais, 280kgs, £705. Ballycastle producer, Charolais, 300kgs, £725, 350kgs, £760. Ballymena producer, Charolais, 495kgs, £1,015. Bushmills producer, Charolais, 300kgs, £680, 355kgs, £715. Glenarm producer, Limousin, 290kgs, £600. Martinstown producer, Belgian Blue, 525kg, £1,030. Ballycastle producer, Aberdeen Angus, 400kgs, £775, 500kgs, £905, 560kgs, £1,070, 490kgs, £910. Ballymena producer, Limousin, 505kgs, £1,000. Armoy producer, 3 Aberdeen Angus, 230kgs, £500. Glenbush producer, Charolais, 370kgs, £750. Ballycastle Limousin, 520kgs, £1,020, 490kgs, £960, 550kgs, £1,100. Bushmills producer, Charolais, 300kgs, £640, 330kgs, £685. Ballymena producer, Aberdeen Angus, 560kgs, £965. Bushmills producer, Simmental, 230kgs, £520, 220kgs, £520, 280kgs, £570. Bushmills producer, Aberdeen Angus, 590kgs, £1,010, 600kgs, £1,070. Glenarm producer, 290kgs, £600, 300kgs, £605. Ballycastle producer, Limousin, 455kgs, £830. Fat cows sold to £930 for 600kgs.